Watauga County Schools has named its 2019-20 teachers of the year — one from each school in the district. Chosen by their peers, the group was selected from a group of more than 300 teachers district-wide at all grade levels. This year’s group includes Callie Jarman from Bethel, Sarah Holt from Blowing Rock, Anne Donadio from Cove Creek, Carly Mize from Green Valley, Tammy Whichard from Hardin Park, Gayle Oliver from Mabel, Heather Miller from Parkway, Mitchell Wright from Valle Crucis and Jennifer Williams from Watauga High School. The teachers were surprised in their classrooms over the last several weeks by a groups of their peers, family members and staff who gather in each school’s office to surprise the award winner mid-class. 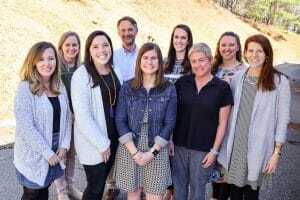 Watauga County Schools Superintendent Scott Elliott offered his congratulations to the newly-named teachers of the year, and thanked them for their dedication to their craft. Each school’s teacher of the year will receive an award of $350 from the school system and is automatically a candidate for Watauga County Schools Teacher of the Year. The person chosen as WCS Teacher of the Year will receive an additional $350 from the school system. Local businesses will also be given an opportunity to donate gift certificates or other prizes to help recognize teachers of the year. The businesses that supported Teachers of the Year with donations in the past include Chetola Resort, Chick-fil-A, Stick Boy Bread Company, Panera Bread, AFLAC, Bandana’s Bar-B-Q and Grill, Dos Amigos, Friendship Honda of Boone, Hardee’s, Makoto’s, Subway, Cornerstone Bookstore, BeanStalk Community Theatre, Haircut 101, Michael’s, Omega Tees and Screen Printing, Precision Printing, Hibbett Sports, SageSport, Blue Ridge Vision, Tanger Outlets and Walgreens. Businesses or individuals interested in making a donation this year are encouraged to contact Human Resources Director Stephen Martin or Public Information Director Garrett Price at (828) 264-7190. The WCS district-wide Teacher of the Year will be announced in May after a selection process that includes interviews, unannounced teacher observations in classrooms and a review of a written statement of teaching philosophy prepared by each candidate.